7am - The sleeping plan for Miss Twayler was, sleep on the pull out sofa bed. That did not work. It was just to hard for me to open that sofa into a bed! So, I have been sleeping on the sofa part of the sofa/bed. Not too bad. Not great either. A mattress was ordered from Amazon. But mysteriously, that mattress never arrived?! It got close though. Post Office delivery left a notice that "Mail box is full, could not deliver the package." Strange notice! A mattress in a mailbox? That mattress delivery mystery, went on for several weeks. 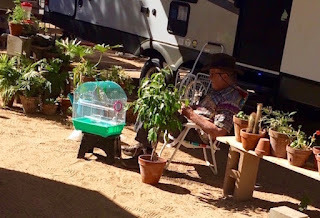 Then we cancelled the Amazon mattress, and ordered a mattress from Banner Mattress, here in the Town of Apple Valley, CA. That Banner mattress is scheduled for delivery today. We have not Blogged to you recently about our full extension drawer slide out project. That's because that project got a bit stymied. We bought two sets of four foot long full extension slide hardware. When we began the installation of the second drawer, it was learned that Twayler is 8-feet wide on the outside. On the inside of the pass thru storage area, the dimension is about 4" less! So, we had to figure out how to fit the two sets of 96" long hardware into a 92" space. At first this seemed to be an impossible task! But then we came up with a solution. Raise the second drawer's hardware to a position above the height of the first drawer's hardware! This solution requires that the 2nd drawer's length be reduced to fit. We may do the installation of the 2nd drawer today. Boid and George were catching some rays out front of Twayler, when the two mattress guys showed up. The guys put the mattress in its place in the bedroom. Now we are going to Home Depot and buying some wood for the mattress install. 3pm - Boid is gone, long live Boid! On returning from shopping, we found Boid's cage had toppled off of the stool that it was sitting on. The cage and Boid were outside. Apparently a wind came up which knocked over Boid's cage. Seems impossible that a wind could be that strong. But that's what happened! We are now headed over to PetSmart to look there for our little Boid. We think he may have flown over there. We'll let you know! PS: Commenters have suggested that perhaps a bird of prey or a dog or cat could have done this dirty deed! 5pm - Boid is back! Well, not exactly the same parakeet that has been living here for the past several weeks. Same blue color. But, much, much younger. This new Boid is only about 3 to 4 months old. I am able to tell new Boid's age by his cap [head] feathers which have stripes which go all the way down his head to his cere above his beak. Old Boid had a pure white cap [no stripes], showing that he went thru his first molt and was likely 8-months to 1-year old. Be well, old Baby Boid! Be well. New Baby Boid has his cage covered, and is going to sleep in Twayler's front room. For the very first time, George is going to sleep in his bedroom. On the new mattress. PS: We say a prayer for Old Baby Boid, who may have met disaster this afternoon. We will never know for sure what happened to Baby Boid. We pray that his guardian angel is watching over him. Gotta have a good sleep, good luck with the mattress, should be better locally. Banner Mattress just phoned a few minutes ago. The new twin size mattress is scheduled for delivery this morning. I have often thought I would like a slide out drawer but always thought I would be losing a lot of space under the drawer. You are correct about losing space under the drawer. The benefit is, the contents of the pass thru does not have to be emptied to get to some item in the rear. George, regarding that notice you received from the U. S. Post Office, it sounds like the Post Office wanted you to drive to their facility and pick up the mattress package. Did they happen to put an address of their facility on the notice? 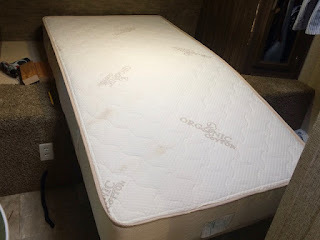 As a temporary fix for dear husband and myself, we went to Wal-Mart and purchased two twin-size 2-inch thick memory foam pads (twins because they are easier to handle individually) to use on our converted queen-size dinette until we purchase the right mattress. The memory foam pads are very comfortable, are encased in a cover, and are very cheap. You might get someone to help you open the sofa and just leave it that way with a Wal-Mart memory foam topper until your permanent sleeping accomodations are set up. That post office non-delivery is a moot issue now. Banner Mattress just delivered my new mattress. George, Hoorah for you! Let us know how you feel after sleeping for a night on your new mattress. For us, memory foam rocks! Poor little Boid! Out in Mother Nature on his very own. Well, such is life. You just never know. Maybe a bird of prey tried to get at boid and knocked the cage over or even a cat or dog. Maybe boid's cage should have been hanging up high? Good luck boid. Baby Boid is free to fly. That's not all bad. Thank you sooooo much for reminding! Baby Boid is free to fly.